I'm afraid it is goodbye from me, and goodbye from them. Japan waved farewell to a memorable World Cup campaign after another impressive victory, while their respected coach Eddie Jones also said sayonara to the nation. USA skipper Chris Wyles admitted before that the game was likely to be his World Cup swansong. Although he didn't nab the victory that he craved, the 32-year-old Saracens full-back did create a bit of history for himself. Wyles's second-half try means he now stands alone as the USA’s top try scorer (four) in World Cup history. United States captain Chris Wyles, speaking to ITV: "It came down to consistency and that was the story of our World Cup so you have to give credit to Japan. "They showed what you can do with four years of proper preparation. There's talk about our potential and it's about finding the right formula. It's tough for our guys, we need to get everyone on the same level. "Any time you play in a World Cup it is an amazing experience. Ultimately though you want to come and compete. No-one wants to come and just lose games. We showed some good glimpses of rugby but we need to find a full 80 minutes." Heart-warming scenes as the entire Japan squad gather in one corner of Kingsholm to pose for the dozens of gathered cameras. Flashbulb lights go ten to the dozen as the snappers get their perfect shots. And so do the fans, who also sing in harmony with the Brave Blossoms players. Brilliant. Japan coach Eddie Jones speaking to ITV: "I've done my job with Japan and that's me done. I wanted to bring back pride and I've done that. "If I look at that squad about 60% of them can go on until 2019. A home World Cup should be an advantage. Obviously for us it would be great for us if South Africa won the World Cup now. "Tonight we played as well we as we can. It's been fantastic. The guys have all played above themselves and played in a real great spirit. The USA kept coming and it was their best performance and I don't know why they saved it for us!" Jovial Japan coach Eddie Jones is not down there yet because he has been collared by the post-match interviewer. The Stormers-bound boss says he is not tempted to continue at the Japan helm. Then he says he hopes South Africa - who his underdogs shocked at the start of the tournament - win go on to win. "That will be great for us," he says, with a glint in his eye. Pandemonium down on the Kingsholm pitch as the Japan players wander round the perimeter to soak up all the plaudits on a well-deserved lap of honour. Head coach Eddie Jones, who is now leaving his role, watches down from his spot in the stands. Kids, flags, selfie sticks...they're all on the turf. If the 2015 World Cup was a popularity contest then Japan might well have won the damn thing. But, in real money, that crucial defeat by Scotland means they fell just a point shy of reaching the knockout stage. It doesn't matter. They have impressed the world with their exciting brand of rugby and, with plenty of excitement back home, it all bodes well for 2019 when they host the tournament. But it is a different picture for the Americans who slump to the greasy Gloucester turf. Four matches, four defeats. Japan's players jump into the air and embrace each other, knowing they can now be considered as their nation's greatest ever team. They have won three matches at a World Cup for the first time - and will return home as national treasures. The Americans desperately go through the phases but that is all that it is...desperate. And when Japan do win the turnover, the ball falls into the hands of full-back Ayumu Goromaru who smashes into touch. All over! Japan try to run the ball from deep, prompting shrieks of excitement from the Gloucester crowd. But they are punished for holding on with Andrew Durutalo - the USA's standout performer - causing trouble at the breakdown. He marches forward from a quick tap, but can't find a way through the cherry and white defence. And that's the sound of USA's hopes being extinguished by Japan. The Americans lose their discipline at the crucial time, gifting a kickable penalty to the lethal boot of Ayumu Goromaru. He snaffles the three points. As USA move within a converted try of hauling themselves level, they return to their full complement of players as the ginger-bearded Eric Fry - who a touch of the Alexei Lalas about him - comes backs on. Former Scotland fly-half Craig Chalmers among those who will miss Japan in the rest of the tournament. "Get in the holllle!" shouts one overly-enthusiastic USA fan. We'll let him off - it was a quality try. AJ MacGinty spins a wonderful long pass out on the overlap on the right flank, allowing Saracens full-back Chris Wyles to stroll in for an easy try. These Japan and US blokes are having more big hits than One Direction at the moment. Tiny Japan scrum-half Fumiaki Tanaka is cleaned out by an American opponent about a foot taller and eight stone heavier. Total mis-match. "Oooh!" gasps the Kingsholm crowd in unison. That's because Amanaki Mafi smashes another hole in the American defence close to the halfway line. Within a matter of seconds, the USA are paid to pay. And it is simple stuff from Japan. They leap to claim a line-out close to the US line, with that brutish number eight Amanaki Mafi ploughing through a wall of navy blue shirts to touch down. Here's a rarity - Ayumu Goromaru misses the conversion. Long way back for the US. Japan wing Kotaro Matsushima returns to the field after passing his head injury assessment. And his first job is help stop an American raid down the right flank. Jet-heeled wing Takudzwa Ngwenya - the man who famously stopped renowned speedster Bryan Habana at the 2007 World Cup - sticks on the afterburners but is caught by Amanaki Mafi. Captain America - or, more accurately, a bloke dressed as Captain America - grins at the camera as AJ MacGinty claws back three more points with a routine penalty. The USA XV need to perform like super-heroes in these final 25 minutes if they are going to finish this tournament on a high. Better from the US side. Quick ball through the hands finds wing Zach Test lurking close to the touchline, but as he steps inside he sees a wall of cherry and white shirts blocking his route to the try-line. The Eagles go back inside, but then undo their good work with a forward pass. Ouch! Japan wing Kotaro Matsushima is seeing stars after being clobbered in the collision. He trudges off for a head injury assessment and is replaced by Karne Hesketh - the hero in that win against South Africa. Let's see if USA can muster a response. A precise kick into the corner tees up a line-out and lanky lock Greg Peterson climbs highest to grab the ball. The Eagles try to work the ball out left, but a forward pass is spilled by Thretton Palamo. Double trouble. Japan scrum. Can Goromaru boot over another three points? Of course he can. The Japan full-back cleanly sticks his size nine through the ball and it goes sailing through the middle of the sticks. Japan's turn to restart the action at a humming Kingsholm. Eddie Jones makes a pair of changes at the break, Kensuke Hatakeyama and Amanaki Mafi replacing Ryu Koliniasi Holani and Hiroshi Yamashita. They have won four turnovers while the Japanese have won three. In terms of metres, there is not much between the teams with USA having run 132m with the ball, while Japan have run 138m. The US have had 57 carries to Japan's 61. In defence the Americans have made 56 tackles but missed 10. Where as the Japanese have made 55 tackles but only missed eight. No such thing as a dead rubber at this Rugby World Cup. Electric atmosphere at Kingsholm and a scintillating, competitive, compelling match emerging here at half-time. Japan's look pretty satisfied with themselves as they jog back into the Kingsholm dressing room for a swig of water and some final words of wisdom from Eddie Jones. The Japan head coach is leaving his role after the tournament remember. Right here's a good opportunity for the Americans to put themselves within striking distance of the Japanese at the break. But they spill the ball inside the 22 and that should be about that for the first half. The Americans kick deep into Japanese territory and pound forward as they look to defend high up the pitch. Japan try some kamikaze defending, attempting to pass their way out of trouble, only for Craig Wing to be collared behind his own sticks. Japan probe for another opening, but are thwarted by USA back-rower Al McFarland, whose dogged defending alleviates the pressure. This guy's right boot is more accurate than a top-of-the-range sat nav system. Ayumu Goromaru goes through his Jonny Wilkinson-style pre-kick rehearsal, then thumps the ball straight through the sticks from just inside the American half. Japan in control. And that error from the restart has proved very costly. Japan surge forward as their pack drives at the American line. Eventually the pressure tells as wing Yoshikazu Fujita finds a gap to dash through. Ayumu Goromaru adds the simple conversion from just to the right of the posts and the lead swings back in the favour of Japan. The Americans finally decide that is time for a change of tactic - and it pays dividends. After sucking in plenty of Japanese bodies in front of their own posts, scrum-half Michael Petri goes right to Chris Wyles, whose raking pass misses out a couple of team-mates to Takudzwa Ngwenya. No mistake from the flyer, who bags his first World Cup try in eight years. Japan's defence is being asked some serious questions as the USA set up camp inside the 22. Powerful number eight Samu Manoa continues to pummel the Japanese as the Eagles go through 17 phases down the middle. Time to go wide? But the USA cannot make Japan pay for that indiscipline, the Brave Blossoms winning the turnover. Plenty of errors from both sides in a stop-start opening quarter. Japan scrum-half Fumiaki Tanaka scurries out of the set-piece, looking to orchestrate another attack down the right flank. But, under a suspiciously high tackle, loses control of the ball and the USA have it back in their grasp. Japan have plenty of numbers forward and seem in control of their attack as they contemplate their next move inside the USA 22. But they take their eye off the ball - allowing Andrew Durutalo to nip in and win the turnover. Japan's first foray into American territory ends in their first try. Wing Yoshikazu Fujita flies down the right flank in pursuit of a kick forward and when he cannot finish, the Brave Blossoms switch play across the line, teeing up Kotaro Matsushima in the opposite corner. Ayumu Goromaru arrows in the kick from the touchline, holding its line to sneak inside the right post. No need for AJ MacGinty to find his range. The USA fly-half, despite a potentially off-putting jeer in his run-up, slams over the three points. But the USA let the Japanese off the hook as a pass creeps forward and ref Glen Jackson hauls back the action. Australian-born cross-code convert Craig Wing is set to become Japan’s oldest World Cup debutant as head coach Eddie Jones makes four changes. Wing replaces Male Sau in the centres, while prop Hiroshi Yamashita, second-rower Justin Ives and wing Yoshikazu Fujita also start. United States coach Mike Tolkin makes 13 changes to the starting XV that was thrashed by South Africa on Wednesday. Only number eight Samu Manoa and wing Zach Test retain their place, while full-back Chris Wyles returns to captain the side. Kingsholm has more colour than an abstract expressionism artist's palette. Red, blue and white dominates the Gloucester crowd, with American stars and stripes slightly outnumbered by Japanese circles of the sun. By far the best fancy dress I've seen this evening from these four French gentleman. I asked them: 'why?' They replied, 'why not'. United States captain Chris Wyles says he is desperate to cap a record-equalling - and possibly final - World Cup appearance with a swansong victory. The 32-year-old full-back is pulling on the Eagles jersey for the 11th time at the tournament and admits the 2019 tournament is likely to be beyond him. "I hadn’t thought too far ahead but it probably is my final World Cup match," says the Saracens man. "There is probably a little bit of extra motivation, but if we can come away with a win, that will be the icing on the cake." Japan coach Eddie Jones on ITV: "We have tried to put Scotland v Samoa to the side in our preparations, we were supporting Samoa but didn't worry too much. We have been focusing on this match and getting our third win. "We want to play our best rugby at this World Cup - we haven't played it yet. We want to put 80 minutes together tonight." Japan started this tournament not having won a World Cup match for 21 years - now this side are on the verge of becoming the nation's greatest team by earning their third victory. The reason for the success? Togetherness. The bond between the blokes in this squad is tight. And we see that as skipper Michael Leitch leads his team back to the dressing room after their warm-up. All 23 men walk back as one with each player having their hand on a team-mate's shoulder. No doubt who are the most vocal of the two sets of fans with the Japanese supporters in fine voice outside Kingsholm. USA made sweeping changes for that match against South Africa, seemingly keeping back many of their better players for what the Eagles hierarchy have identified as a 'winnable' game against Japan. 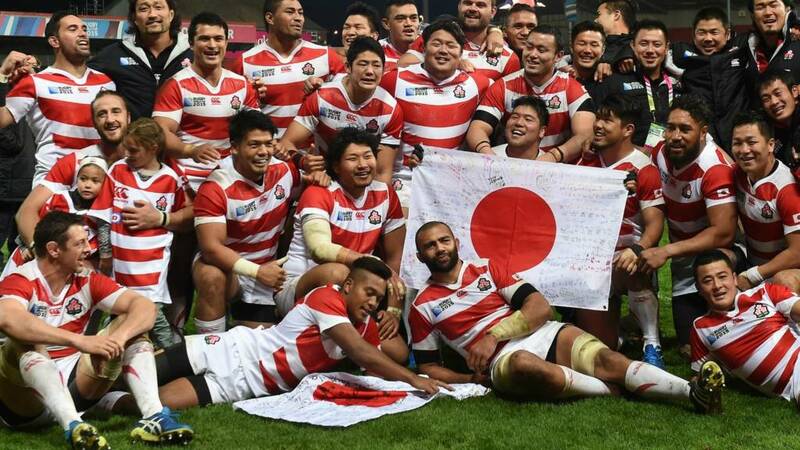 "The punters will be saying Japan are the favourites, but every underdog has their day." That opening win against South Africa surprisingly blew Pool B wide open, with Japan still capable of reaching the quarter-finals for the first time until Scotland's nail-biting win yesterday. But there have been contrasting fortunes for their American rivals. USA are yet to even pick up a losing bonus point, suffering the biggest hammering of the tournament when they were nilled by South Africa on Wednesday. No matter what Japan do against the United States tonight, they know that - because of Scotland's win against Samoa yesterday - they will be heading back to Tokyo on Monday. But that hasn't stopped them becoming everybody's favourite second team, courtesy of that seismic win against South Africa and the steamrolling of Samoa in their last outing. The biggest shock in the sport's history. The best game in the history of the Rugby World Cup. Japan's famous victory against South Africa sent shockwaves that are still reverberating around the rugby world and continues to be celebrated as the iconic moment of the tournament so far. However, despite their heroics, the Brave Blossoms will drift away from the 2015 World Cup after the next 80 minutes of rugby. Those big bad Scots have blown them out of the competition. Little over three weeks ago, the sporting world was shaken to the core. Japan, who had not won a World Cup game since 1991, beat South Africa. Yes, two-time world champions South Africa. Giants of the international game - Jonny Wilkinson, Sir Clive Woodward and Jonah Lomu among them - couldn't sign into their Twitter accounts quick enough to bash out their exclamation in 140 characters or less.